This football soccer table is perfect for any indoor amusement between family, friends and colleagues. It features wood construction, Strong steel rods with slide bearings for smooth rotation and ball serve cups on both sides for convenience. There are fabricated focused of players, soccer field and crowd graphics and scoring device on both sides. Welcome! High quality with competitive price can be realized here!Note:Simple Assemble is required according to the included instruction. 2.Please make sure all the connections are tightened before using. Please keep the foosball away with the children under 3 years old. Why You Purchased from us? 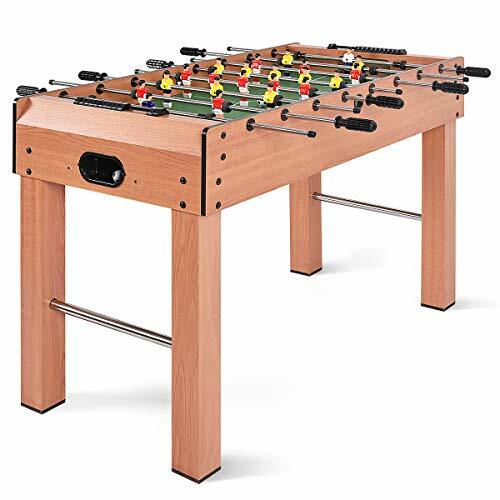 【Easy To Play】This foosball table has strong steel rods with slide bearings for smooth rotation and ball serve cups on both sides for convenience. There are fabricated focused of players, soccer field and crowd graphics and scoring device on both sides. 【Durable Wood Frame】Do you need a sturdy and durable foosball table? This one is constructed of strong wood construction and solid steel rods, sturdy and reliable, can serve you for a long time. In addition, 4 leg construction provides additional stability. 【Ideal for Adults and Kids】This foosball table is large sized, fun for both kids and adults will be able to get lots of enjoyment from this versatile and simple-to-use interactive furniture. It will fit in nicely in a game room, garage or playroom to give you a unique entertainment option. 【Fun Foosball Competition Table】If you are a football fan, our Giantex Foosball Table will give you a great time. Perfect for any indoor amusement between family, friends and colleagues. 【Perfectly Sized and Easy Assembly 】Overall Dimension: 48″ X 24″ X 31″(L X W X H) suitable for daily use and all parts are packed in the package, easy assemble is required.